‘Audit’ or ‘Auditing’ is an activity which is undertaken by any business organization on its own or by the requirement under any law – to go through its accounts, transactions, and documents – to ensure correctness, legality of it. It is an examination of the accounts and can be conducted by internal or external agencies – known as the auditors. Concurrent Audit means – the audit or examination of transactions happening as and when a transaction actually happens. It is a continuous audit, which goes on all the year around, usually conducted by external auditors (Chartered Accountants) on monthly basis. In concurrent audits daily basis transactions are examined and checked – this ensures any irregularities are nipped at the bud. 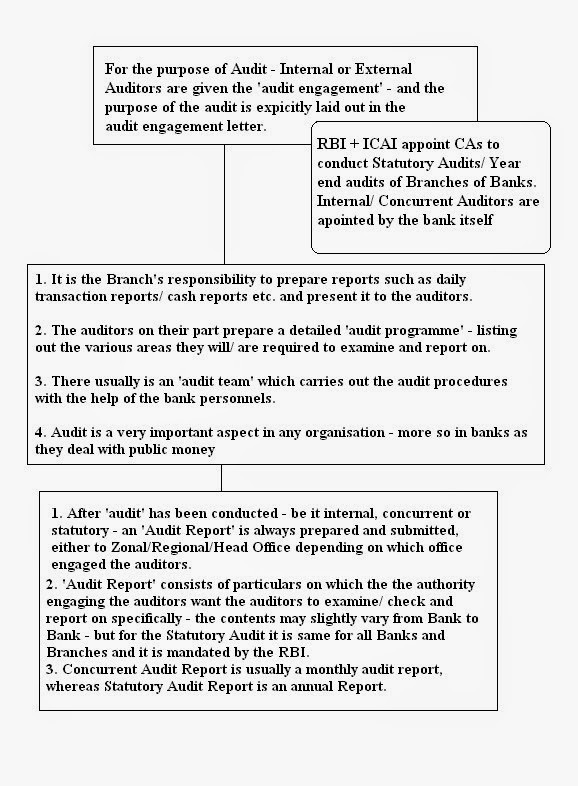 Banks have a huge number of daily transactions – they also have many documentations and other formalities that they have to conform too – through concurrent audit any irregularities or non conformities are easily found out as and when it happens and rectified immediately; this avoids piling up of irregularities which may become a huge problem for any branch when the year end audit comes around! Concurrent Auditors check for daily maximum cash balance adherence compliance, KYC norm compliance, proper documentation of new loan disbursement, checking if new loans have been made as per rules and regulations, income leakage etc. among other things like putting any new RBI instruction to work! ; these are reported on in the ‘concurrent audit report’. Concurrent Audit is a measure to help a Branch to work smoothly and rectify any mistakes to avoid cascading effect of the irregularities. Many banks instead of having concurrent audit or even in addition to having concurrent audits may use ‘internal auditing’. Internal Auditing is when any organization, including a bank, constitutes an audit team within its own organization to cater to its auditing requirements. These internal auditors will visit branches one by one where and when required and carry out auditing. Internal Audit may focus on any specified area or cover every aspect of the branch, depending on its audit programme and requirement; main thing is it is conducted by the bank itself. However one important thing in internal audit is – information systems audit; information systems audit is a new area gaining prominence in the last few years. With rapid computerization in banking sector – core banking, ATMs, mobile banking, internet banking, completely computerized banking functions – it becomes necessary to have a periodical review of how these systems are working. Internal Control audit looks are the information flow, the channels, the security (of information) etc. It also checks for the work ability of new banking software’s and how it rates on security and access. ‘Statutory Audit’ is conducted by a ‘Statutory Auditor’ – the word ‘statute’ means – mandated or compulsorily required by any law or Act; in Bank’s case it is the RBI’s mandate. Every year around the very last days of March (end of financial year) and the beginning of April (first two weeks of April) – in every branch of every bank a very rigorous activity is held – know as the year end audit or the statutory audit! This audit is the most important event for a bank as this decides among other things – the NPA! Which by now, I think most of you would know and appreciate how important it is for any bank – NPA and its provisioning affect the profits of a bank and hence the Balance Sheet and Profit and Loss Account and finally the shareholder’s dividends. Thus Statutory Audit is very important. Statutory Auditors are appointed by RBI in association with the ICAI, to empanel Chartered Accountants for the job. Statutory Audit does not look at the nitty-gritties of the banking transactions (these are looked at by concurrent and internal audits); instead they rely on the concurrent audit reports and test checking to form their opinion. Statutory Audit mainly looks at the loans and advances, compliance with PSL requirements, CRR, SLR etc. and other statutory norms compliance as per the latest RBI circulars. Thus Bank Audit is an important activity undertaken by internal and external auditors, to ensure no fraud is being committed – the overall aim to ensure fair and just banking practice. So when the next time you go to your local branch and witness audit going on specially the Stat Audit – cut ‘em some slack! They’re trying their best to reduce the NPA and its provisioning!